Napalm was a US invention. Napalm “was invented in a top-secret 1942 war research collaboration between Harvard University and the U.S. government”. In 1952 the U.S. Patent Office issued certificate 2,606,107 for “Incendiary Gels” and made napalm’s precise formula available worldwide. “U.S. troops used a substance known as napalm from about 1965 to 1972 in the Vietnam War; napalm is a mixture of plastic polystyrene, hydrocarbon benzene, and gasoline. The accusation of “napalm attack” conjures up terrible images designed to shock. In 1945 the US B29 bombers dropped their payload of 69,000 pounds of Napalm over Tokyo, Japan in one hour. An estimated 100,000 Japanese men, women and children perished in the resulting fire storm. Washington considered the 10 days of Napalm bombing raids across all Japan’s major cities, a huge success. The US also used Napalm in North Korea with devastating consequences for its people in the 1950s. Washington dropped 32,557 tonnes of Napalm on Vietnam. Neer goes on to explain that the UN had banned the use of Napalm against “concentrations of civilians” under Protocol III of the 1980 UN Convention on Certain Conventional Weapons. The US signed the protocol almost thirty years after it had been adopted by the General Assembly, on January 21 2009. It was President Obama’s first full day in office. The caveat being “the US can disregard the treaty at its discretion if doing so would save civilian lives“. 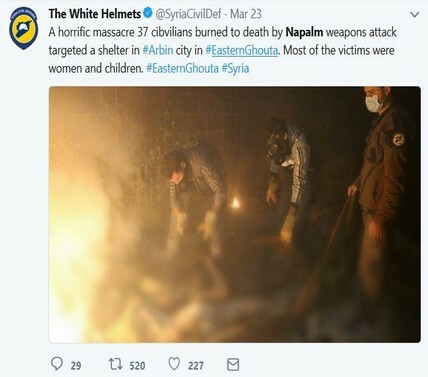 Considering just how many civilian lives had been destroyed by the US deployment of Napalm, it is hard to imagine a scenario where Napalm might be beneficial to civilians…but the inference is “we should trust the US to make that decision on our behalf and on behalf of the civilians in any given situation“. This alleged attack, reported by BBC Panorama, was naturally accompanied by the familiar witness testimony effectively calling for the World to intervene and bomb for “Peace” – “Dear United Nations, you are calling peace, you are calling for peace. What kind of peace are you calling for? Don’t you see this, don’t you see this? What do you need to see?” from the Telegraph article at the time. Terrorist Chemical Weapon Capability in Eastern Ghouta. 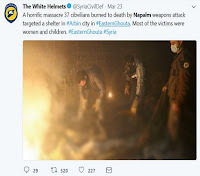 “The media disinterest is strange, given that US officials appear poised to green-light military attacks against Syria, which they claim has used chemical weapons (CW) against civilian populations. This charge remains unproven and highly contentious, with other parties arguing that anti-government militants are employing CW munitions to provoke a US military intervention against Syria. I had a similar experience two days ago on the 6th April 2018. We were on a foreign media trip to the liberated sectors of Eastern Ghouta with the Syrian Arab Army. Many western media journalists resent being accompanied by what they perceive as “security” but my experience is that they are not prevented from covering any story they think is important in areas they visit. Primary supporters of the regime change “humanitarian” war narrative, CNN were on this trip with me – correspondent, Frederick Pleitgen, his camerawoman and a translator, I did not see them restricted in any way, on the contrary they were given free rein provided the area was clean of mines, IEDs and booby traps left behind by the evacuated terrorist groups. The army’s presence is necessary in any district recently liberated as there are always risks involved and I am grateful that they care enough about our safety to be with us on these trips and to provide answers to any questions we have. A bag of RDX chemical compound, Erbin, Eastern Ghouta. …“Before you believe the CNN warmongers in Damascus. Their correspondent, Frederick Pleitgen, was with me when we visited a terrorist chemical weapons lab in Erbin, Eastern Ghouta two days ago. He does not mention it in his sensationalist report “live” from Damascus. Nor does he mention the estimated 3500 plus prisoners being held by Jaish Al Islam terrorists in their “repentance” prisons, many women and children among them who are very probably now being murdered to produce the last ditch attempt chemical weapon attack” ~ Vanessa Beeley Facebook status. In other words, the corporate media lies are becoming more blatant as the SAA and allies march inexorably towards full and final liberation of Eastern Ghouta which has long been recognised here as a pivotal strategic stronghold for Israel, effectively crippling Damascus’ air defence capability and maintaining pressure on the Syrian government and people with the daily collective punishment of civilians by indiscriminate terrorist shelling, mortar fire etc. Not for much longer.